This characteristically boat-shaped kashkul has two dragon’s head finials which are pierced to allow the kashkul to be hung from a chain. It is incised with medallions of Farsi (Persian) script in various cartouches and roundels against a background of profuse flowers and scrolling foliage, and a broad band of Arabic along the rim of both sides. No part of the exterior is without decoration. Unusually, the bowl is cast with a large fish at each end. It stands on a splayed cartouche foot. Included among the Arabic and Farsi script are Koranic verses and words that translate as: ‘Gift from Kashmir’, ‘Owner Abdullah Yamlu’, ‘The year 1332 of hijra’ [1913-14] and ‘Made by Khidr Khu’(?). Wealthy aristocrats and merchants sought the company of sufis and dervishes and sometimes commissioned such kashkuls which were then presented to them. 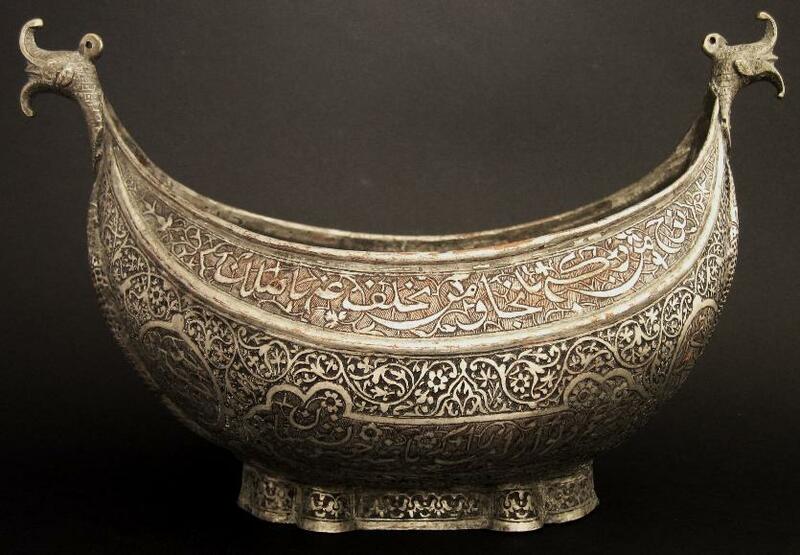 Probably this begging bowl was commissioned by a wealthy Kashmiri patron to be presented to a passing dervish. Sotheby’s London, ‘Islamic Works of Art’, October 21, 1993, lot 229.